"I don't feel I have to be everyone." Cohen Media Group has released the full, official US trailer for Michel Hazanavicius' somewhat controversial film Godard Mon Amour, which premiered at the Cannes Film Festival last year with the title Le Redoutable. The film focuses on famous French filmmaker Jean-Luc Godard, and his time in the 60s when he made La Chinoise with young Polish actress Anne Wiazemsky. He fell madly in love with her, the two eventually married, but the events of May 1968 shook Godard and things started to get a bit unstable. Louis Garrel plays Godard, and Stacy Martin plays Wiazemsky, with a cast including Bérénice Bejo, Micha Lescot, Grégory Gadebois, and Félix Kysyl. This film is more of an homage to Godard, than a profile of the director, but it's honest and accurate. And it's a surprisingly good film, that examines the challenges of an intellectual filmmaker in an ever-changing society. See below. Paris 1967. Jean-Luc Godard, the leading filmmaker of his generation, is shooting La Chinoise with the woman he loves, Anne Wiazemsky, 20 years his junior. They are happy, attractive, in love. They marry. But the film's reception unleashes a profound self-examination. The events of May '68 will amplify this process, and the crisis that shakes the filmmaker. Deep-rooted conflicts and misunderstandings will change him irrevocably. Revolutionary, off-the-wall, destructive, brilliant, he will pursue his choices and his beliefs to the breaking point… Godard Mon Amour, originally titled Redoubtable, is directed by Oscar-winning French filmmaker Michel Hazanavicius, director of the films Mes amis, OSS 117: Cairo Nest of Spies, OSS 117: Lost in Rio, The Artist, and The Search previously. The screenplay is also written by Hazanavicius, based on Anne Wiazemsky's autobiography "Un an après". This first premiered at the Cannes Film Festival in-competition last year, and also played at the Toronto and London Film Festival. 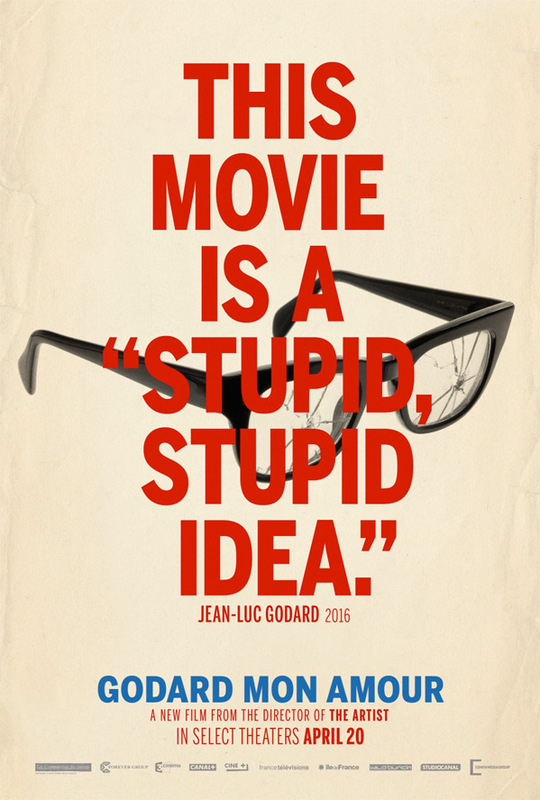 Cohen Media will release Hazanavicius' Godard Mon Amour in select US theaters starting April 20th this spring.